This contribution traces the history of public policy in Colombia by looking at some key national and international actors and institutions as a means to understand how the policy-making process in the country has evolved and how it has become an academic discipline. A historical approach is used starting from the development of policy-making from the beginning of the twentieth century to the 2000s, when public policy emerged as an academic field. It is assessed that actors in the agriculture sector and multinational development banks and agencies have been pivotal in shaping decision-making in Colombia. 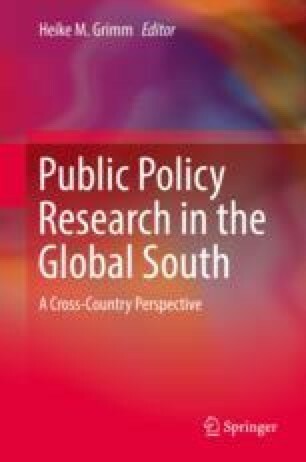 Further elaboration focuses on three moments of Colombia policy-making: (i) the relevance of agricultural actors and international treaties; (ii) the significant role of multinational development agencies in the 1990s and the implementation of a new model of public administration; and (iii) academia as field of policy research. The analysis shows that throughout most of its history, Colombia has been under the influence of international actors and frequently adopted foreign ideas and models of development to serve as a basis for its own policies, which eventually led to the demand for policy analysts and thus to the academic field. Moore, A.-M. S., Florez, A., & Grajeda, E. (2010). Evaluation of education programs developed by the public and private alliance between the coffee growers committee of Caldas and the state government of Caldas, Colombia. Final Report. Academy for Educational Development. https://eric.ed.gov/?id=ED537470. %2D%2D- Center.